Dean, what wood did you use? Dean, may I ask what finish you used? It definitely looks like pine. 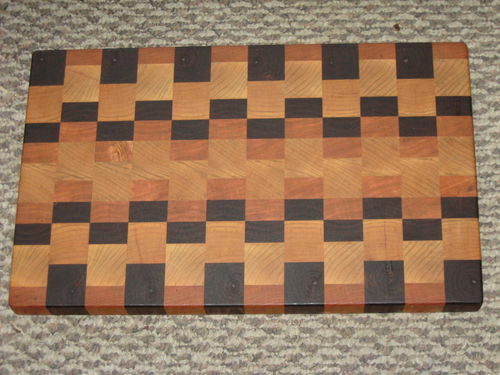 Typically, folks tend to make cutting boards from hardwoods which will hold up better over time. Some folks prefer to make long grain boards while others, like myself, prefer to make end grain boards. I’ve been a fan of making cutting boards for a couple years and I’ve only ever used maple, cherry, and walnut. I am no expert by any means, but the porosity of the wood seems to also determine a given wood’s suitability to an end grain board. I read that oak has larger pores than the 3 woods mentioned above and so “they” say oak is not a preferred wood for end grain boards. Other tendencies I’ve noticed is the used of Titebond III for glue ups due to its food safe rating as well as its performance with moisture, and the use mineral oil for finishing also due to its food safe property (I like to use a mixture of about 4-1 mineral oil to beeswax because it gives the board a soft sheen finish while still making the cherry and walnut “pop.”). I read that using olive oil as finish can “spoil” or go rancid, but have no proof other than the article I read. Good luck with your board, but be careful, making cutting boards can become habit forming. Nice looking board. It gets addictive now. You may want to make many more. If your stripes are not end grain, it’s likely that the board will develop cracks over time. I wouldn’t lose any sleep over it – just use it until the cracks show. Next time go all end grain and it will last for years. Learning is the key. I like the thickness and the size of it. You seem to have that down. Yep, I wouldn’t use pine, but who cares, like you said, this was a learning opportunity. Nice stuff. Make a point of sharing your next few boards as well. You know, it’s a right of passage, first the workbench, then the cutting board. You are now a legitimate woodworker! Congrats!!! (tongue planted firmly in cheek). I think it looks cool… the large circles remind me of modern art geometries. I’ve never made one myself, but have some wood squirreled away for the occasion. Despite it being pine, use it anyway. It will get all raggedy, but so what? I bet it lasts longer than one would think. Dean, the reason I asked is I thought it looked like redwood. Nice to try end grain. I burned my attempt at end grain. for finishing, I bought on Amazon By Bob Flexner..Finishing 101. worth the $10 just 3 years ago. covers many finishes. He is a noted expert on finishing woods. I got my tip on this from a crafter I was trying to learn about his finishes. I will look at your workbench. There are several UTube videos on end grain boards. With different colors of wood and different ways of turning the first cuts, design possibilities are virtually endless. I use maple, walnut and cherry. They compliment each other and produce interesting patterns when you think out the results before glue-up. There are several oils made especially for cutting boards. Boos is one, and you can find a couple at Lowe’s. All three of the above woods are striking when that oil hits them.